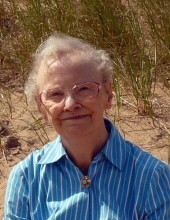 Marilyn Ruth Dupuis of Plymouth, died January 27, 2019. She was 87 years old. Marilyn was the beloved wife of the late Robert who died in 2009, loving mother of Michael (Mary) Dupuis, Mary (Rob) Sammel, and Ann (Andy) Provo. Proud grandmother of Ryan, Kevin, Matthew, Grant, Jacqueline, Alyssa and Cara. Visitation will be Friday, February 1, 2019 from 4:00 P.M.to 8:00 P.M. at the Schrader-Howell Funeral Home, 280 South Main Street, Plymouth. There will be a Scripture Service at 7pm at the Funeral Home. Her Funeral Mass will be Saturday, February 2, at 11:30am at Our Lady of Good Counsel Catholic Church, 47650 North Territorial Road, Plymouth. Family and friends may begin visiting the Church at 11am. In lieu of flowers, memorial donations may be made to the American Heart Association. "Email Address" would like to share the life celebration of Marilyn R. Dupuis. Click on the "link" to go to share a favorite memory or leave a condolence message for the family.